Steppes extend across the European territory, Western Siberia, and Kazakhstan as a continuous, 200-600 km wide belt. In Southern Siberia, steppe vegetation occupies the intermontane depressions and plateaux. The alpine steppes occur in the southern Urals, Altay, Caucasus, and in the mountains of southern Kazakhstan and Central Asia. Fragments of steppe vegetation widely occur in the ecotone of semi-desert. Steppes and forest-steppes, developing on the plains, are subdivided into a number of subzones according to the dominant types of soil and vegetation (Table 11.1). The most commonly used classification of steppes distinguishes three subzones: northern, typical (or true), and southern (or dry) (Chibilyov, 1990,1992). The subzone of typical steppes occupies the middle position between the northern and the southern steppes. Zonal soils are southern chernozems and species in the taxa Stipa and Festuca dominate. The northern steppe is characterized by the development of polydominant herb-grass communities on the thick chernozems, while in the southern steppe, species of Stipa and Festuca dominate on the dark chestnut soils. Similar differentiation occurs in the forest-steppe in which treeless vegetation communities are also known as meadow steppe (Table 11.1). In its natural condition, the forest-steppe represents a macromosaic of woodlands and open landscapes. Since it is distinguished by lower aridity of habitats, only the most moisture-loving species of sedges occur. Apart from zonal divisions, two latitudinal sectors are distinguished within the steppe and forest-steppe zones: the East European and the West Siberian-North Kazakhstan (Milkov, 1977; Chibilyov, 1990). The East European sector extends in a submeridional direction from the south-west to the north-east. As aridity increases, at a latitude where steppes occur in the Ukraine, semi-deserts develop in the Transvolga region. A number of provinces, shown in Figure 11.4, are distinguished within the East European sector (Milkov, 1977; Chibilyov, 1992). In comparison with the Asiatic steppes, the climate of the European steppes is less continental. There are many European species in both flora (Stipa ucrainica, Bromus riparius) and fauna (the European ground squirrel). Typical of the European steppes are shrublands formed by Caraganafrutex, Primus frudtosa, and P. stepposa. Woodlands of the forest-steppe, riparian forests, and isolated woodlands, which often develop on watersheds in the steppe biome, are formed by Quercus robur, Tilia cordata, Acer platanoides, and Corylus avellana. Composition of woodlands in the forest-steppe (which is the same as of deciduous forests) is discussed in depth above. However, most of the European steppe and forest-steppe is not represented by natural ecosystems. The original steppes have been transformed into agricultural lands almost entirely and at present fragments of pristine steppe occur only in nature reserves and in the areas where dissected topography prevents development. Only the steppes of the Transvolga region have been less affected and the unploughed steppes occupy between 10 per cent and 23 per cent of the area (Chibilyov, 1992). The West Siberian-North Kazakhstan sector extends between the Urals and the Altay (Figure 11.4). Continentality of climate is higher in comparison to the European sector, the amount of precipitation is lower, while the period of snow cover is longer. Stony and saline soils are more widespread while both the proportion and quality of chernozems are lower. A distinguishing feature is the occurrence of numerous lakes. 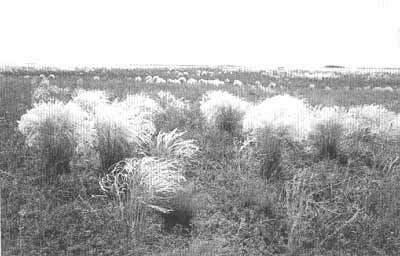 Asiatic species (Stipa korshinski, S. kirghisorum, Artemisia frigida) dominate. The broad-leaved tree species disappear from woodlands that are formed by Betula and Pinus. The share of unploughed steppe, most of which is used as pastures, reaches up to 35 per cent of the area in northern Kazakhstan (Chibilyov, 1992). East of the Altay, steppes develop as fragmented areas in the intermontane depressions of Southern Siberia and the Transbaikal region. Climate is strongly continental with low precipitation and extremely harsh winters (Table 11.2). Even in comparison to Kazakhstan, soils are poorly developed. The vegetation of the East Siberian steppes is similar to that of the Mongolian steppes with a dominance of Stipa capillata and the absence of ephemerals and ephemeroids. In response to the harsh environmental conditions, species-richness declines towards the centre of the continent. While over 200 herbaceous species occur in the meadow steppe of the East European plain, only 55-80 species are typical of Western Siberia and 40-50 of Khakassia. 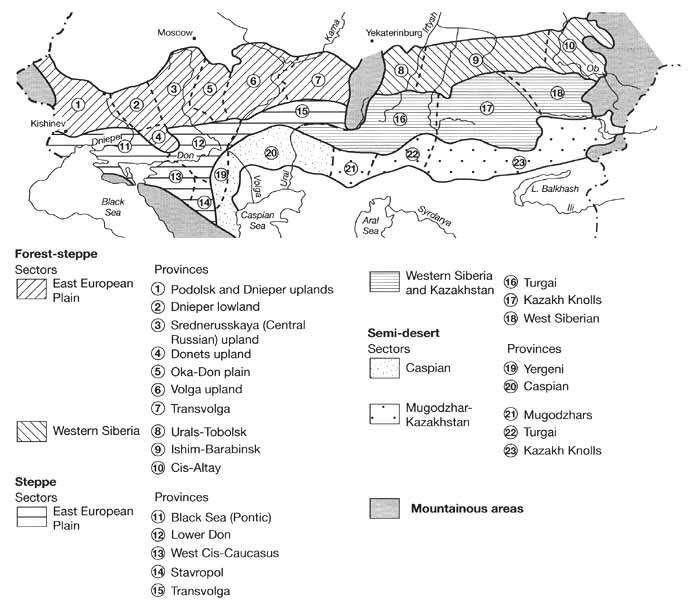 Similarly, dry steppes are represented by 150 herbaceous species in the Askania Nova nature reserve in the southern Ukraine while in Khakassia only 30-35 species occur. This, however, does not imply that the Asiatic steppes are impoverished but rather shows that the European steppes are enriched by meadow species. Traditionally, the proportion of xerophilous species in the floristic composition of steppe vegetation has been used as an indicator of a 'true nature' of steppes. The participation of such species is much higher in the east. Thus, in the meadow steppe in the southern Urals xerophilous species account for 60 per cent of flora while in the region of Kursk in Central Russia they represent only 5-12 per cent (Chibilyov, 1992). The typical steppe species are better adapted to harsh environmental conditions and, therefore, ecosystems dominated by such species are more stable. One of the major adaptations of steppe vegetation is the extensive and deep root system of plants. Root phytomass progressively increases eastwards. The traditional question whether 'steppe ecosystems advance to the forest biome or forests advance to the steppe' does not occur with respect to the Siberian steppes (Titlyanova etal, 1983). The vegetation of the Asiatic steppes, represented by xerophilous plants whose deep and well-branched roots form extensive turf, marginalizes the competition of woody species. In contrast, ecosystems of the European steppes, dominated by less drought-resistant herbaceous species, are less capable of successful competition with woody species.